Sure Sure was also tapped to support Young the Giant on their national tour next year, traveling North America far and wide from January through March 2019. This comes on the heels of their national tour this fall – full dates below and here. “Idiot” follows the band’s charming single “Lie Lie Lie,” which was featured as KCRW “Today’s Top Tune” with airplay on KCRW Morning Becomes Eclectic and Sirius XM Alt Nation’s Advanced Placement Show. The highly collaborative group, composed of Chris Beachy (keyboardist, singer), Charlie Glick (guitarist, singer), Kevin Farzad (drums, percussion) and Michael Coleman (producer, bass, keys), has been releasing independently and systematically over the past couple years. Perched on a hill in Highland Park, the boys self-produce all their music in their house-turned-studio. 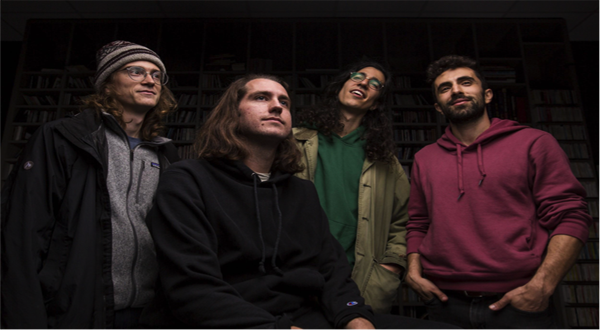 Sure Sure’s recordings and infectious live show have quickly solidified them as one of the most exciting up and coming bands out of LA. Their sound is characterized by a glowing warmth, earworm melodies, and driving rhythms, like if the Talking Heads, Tame Impala and Steely Dan raised their love child together under the California sun. Ever since their 2016 single “New Biome” caught fire on Spotify, the band now has over 14 million total Spotify plays and has been garnering a rapidly expanding audience, both online and in real life. In the summer of 2017 they began a new release cycle, putting out the heartbreak-pop tune “Friends,” dance-tastic “Hands Up Head Down” and others, reaching #1 on the Hype Machine charts and gaining praise from Grizzly Bear, Rostam of Vampire Weekend and other staples in the indie music community. Following their album release in January and national television debut, performing on the ESPYs Red Carpet on ESPN, the band is touring nationwide again this fall on top of two new singles. You can call the boys at (323) 739-0630 if you have any questions, comments, or just want to say hi.